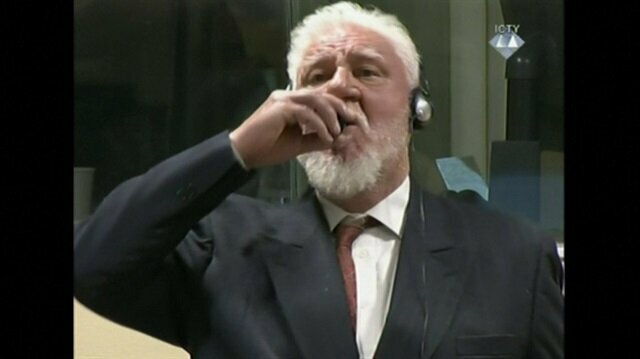 The wartime commander of Bosnian Croat forces, Slobodan Praljak, died after he drank poison seconds after a United Nations judges turned down his appeal against a 20-year sentence for war crimes against Bosnian Muslims, Croatian state television reported. The television quoted sources close to Praljak as saying he died in a hospital in The Hague. The events took place in the final minutes of the court's last verdict. The International Criminal Tribunal for the former Yugoslavia (ICTY), established by the United Nations in 1993, shuts its doors next month when its mandate expires. The defence lawyer for a Bosnian Croat war crimes suspect said her client "had taken poison" on Wednesday during the reading of his verdict at the U.N. war crimes tribunal for the former Yugoslavia. 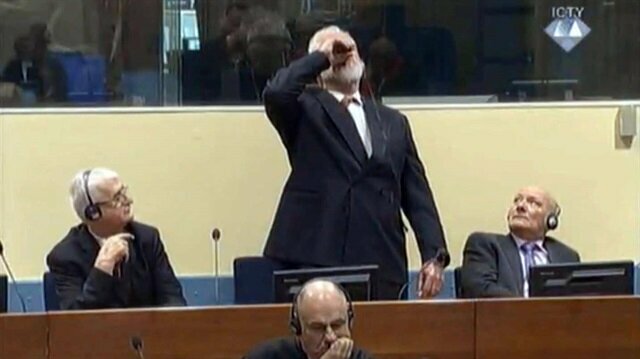 During the reading of his appeal sentencing, former wartime leader Slobodan Praljak appeared to drink from a small flask or glass. The presiding judge called for a doctor and halted the proceedings.